The 2012 Canal Music Fest was held on June 9, at City Park, in Tipp City, Ohio. This was year one in our new location. While technically in the park, we relocated to a large, open area that previously housed ball diamonds. This move provided us with more room. More room for people. More room for parking. Room for a larger stage. More room for everything! 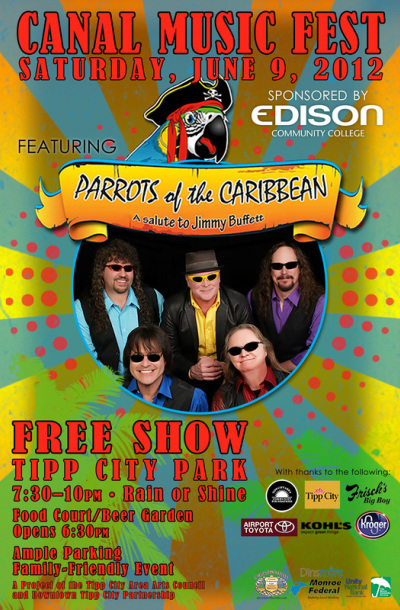 In 2012, we welcomed "Parrots of the Caribbean–A Salute to Jimmy Buffet," and we all become "parrot heads" for a night! We had incredibly great weather this year—a high of 86° with 43% percent humidity—and that is a great summer day for Ohio!